No. 3 & 5, Jalan Bayu 2/3, Taman Perindustrian Tampoi Jaya, 81200 Johor Bahru, Johor, Malaysia. 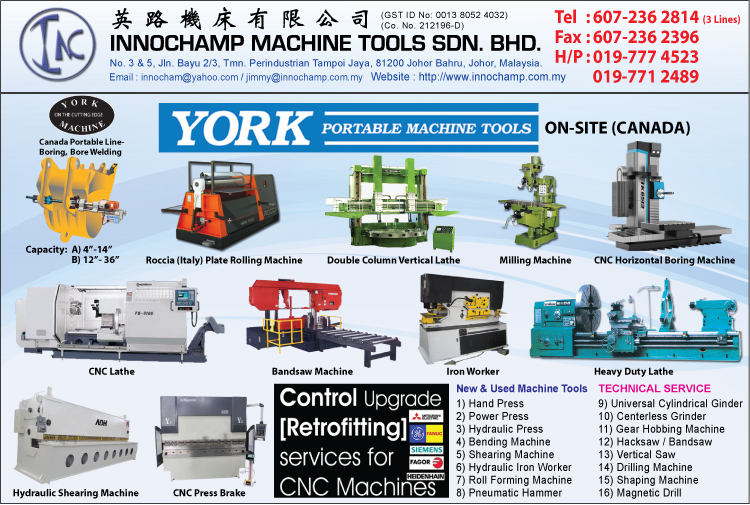 Innochamp Machine Tools Sdn Bhd was incorporated on 5th February 1991 under the name of “Innochamp Sdn Bhd”. The company assumed its present name of Innochamp Machine Tools Sdn Bhd on 21st June 1991 to reflect its principle business activity as a dealer and supplier of machine tools. Innochamp has since grown and expanded to being an importer dealers, agents and suppliers of a wide variety of machine tools, CNC machine tools and machine tools accessories.In anticipation of the imminent recovery of the Malaysian economy, the manufacturing sector is poised to lead, and new investment in high technology precision machine tools is forecast and Innochamp is positioned to take the advantage and capitalize on its strength in this case. Innochamp believes that "High-quality products, the best service" is the fundamental of our company. Customers' recognition is our best honor. We welcome the customers all over the world to visit our company for business. With our efforts together, we think we will make the future of welding and cutting industry better and better.